Last Time Forever: What If You’ve Already Changed? Now among those who went up to worship at the festival were some Greeks. They came to Philip, who was from Bethsaida in Galilee, and said to him, “Sir, we wish to see Jesus.” Philip went and told Andrew; then Andrew and Philip went and told Jesus. Jesus answered them, “The hour has come for the Son of Man to be glorified. Very truly, I tell you, unless a grain of wheat falls into the earth and dies, it remains just a single grain; but if it dies, it bears much fruit. Those who love their life lose it, and those who hate their life in this world will keep it for eternal life.Whoever serves me must follow me, and where I am, there will my servant be also. Whoever serves me, the Father will honor. My sermon from the Fifth Sunday in Lent (March 18, 2018) on John 12:20-33. Listen to the recording below or read my manuscript below. How far would you go to change who you are? Now, that sort of change needs clarification. I’m sure there are parts of ourselves that we are fine with but we might want to change something. Maybe we want more patience or a slower temper. There could be an experience in our past that’s still affecting us and we don’t know how to move forward. We might need a new sense of purpose and meaning, hoping that a new job, new career, or a new perspective on life might give us what we’re missing. Each of us might have these bits and pieces of our personality and our mental, spiritual, emotional, and physical well-being that we would like to change. Luckily, we live in a world where we can take that kind of change on. We’re surrounded by therapists, psychologists, medical professionals, spiritual directors, life coaches, self-help books, and more. Each one of these resources can be an amazing gift from God that helps us grow into who we want to be. But there are parts of ourselves that feel like it’s too had for us to change. And then there’s biology. All of us are made up of DNA – the biological blueprint that determines a bit of who we are. And DNA, this core part of who we are, is something none of us can really change…or at least that’s what I thought until a bunch of headlines flashed by me earlier this week. Changing our DNA, according to these reports, might be possible. But it would take a little work. All we would need to do is jump on a rocket ship, head into space, and live on the International Space Station for nearly a year. Now, living in space might not be something you can do. But an astronaut by the name of Scott Kelly did exactly that. He lived in space for nearly a year and when he came back, he was a little different. Scientists ran all sorts of tests, trying to see how he changed. They took those test results and compared them to the same tests that they ran on his identical twin brother, Mark, who stayed here on earth. The test results were published and articles, earlier this week, said that Scott Kelly’s blueprint, his DNA, had changed. They said that the test results showed that Scott’s DNA was now 7% different than his twin brother’s. Now 7% doesn’t sound like a lot. But when it comes to DNA, that’s…huge. 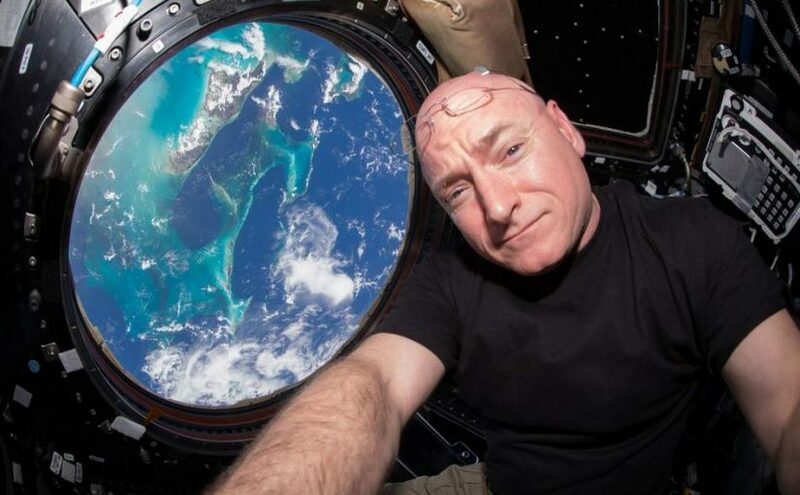 When Scott Kelly first went up, he had an identical twin. There was someone on earth just like him. But if these articles were right, when Scott came back to earth, he was no longer a twin and instead was a brand new person. Going into space seems like a pretty far journey for us to take to change who we are. It’s probably easier to change what we eat, sign up for a community college class, or visit a therapist to grow in the little ways we want to. But there are times, I think, when going to space feels like it’s the only thing we can do to make that big change we need. There are times when everything in our life seems to be going wrong. There are moments when brokenness is all we feel. There are periods in our life when we don’t know what to do next so we keep doing the same old thing even though we know we need to make a change. Some of that hesitation to change comes from an anxious kind of fear. It’s hard and scary taking that first step, not knowing exactly how everything will turn out. And that first step might ask us to do something hard, like ending a bad relationship or moving to some place new. We might need to quit our job even though we don’t have our next one lined up. Or maybe commit ourselves to spending the next few years talking to someone, maybe even taking some medication, so that we can see and engage our world in a different way. All of this is hard. And going to space might seem, in comparison, like it might be easier. We would head up, into the sky, stay there a year, and when we came back down, we would be 7% different. That difference, we tell ourselves, would be all we would need to finally take the hard first steps. We would come back to earth as a that brand new person who could finally become the person we’ve always wanted to be. But it turns, those initial articles were wrong. They misinterpreted what the test results actually said. Scott Kelly’s DNA didn’t change. What changed was his genes, those little biological components made up of DNA. And we expect genes to change when someone is in a highly stressful environment. Scott’s core – his blueprint – his DNA didn’t change. So we can’t just hop on a rocketship, head up to space, and become that new person who can live out the change we want. We’re stuck with who we are. But that doesn’t mean that our limits, our lack of change, is the end of our story. Because our story and our lives have already changed. But that change is sometimes too simple or too small for us to think it’s really the change we need in our lives. We imagine that a brand new person needs something big and over the top, like living in space for a year, to finally grow. We can’t imagine that our newness could be, instead, something that is already given to us. We can’t always trust that our baptism, our faith, and Jesus on that Cross has already made us into something new. Today’s story in the gospel of John is dense. It crams a lot into a very small space. We have Greeks, disciples, and a moment where Jesus claims his heart is troubled but he then shows a God-like amount of self-confidence, There’s a lot going on in this passage – but there’s also a lot that isn’t. And it’s what the Greeks don’t do that jumped out at me this week. Because if we look closely at the text, it doesn’t tell us if they actually meet Jesus. These Greeks went to the disciples, asked to see Jesus, and when the disciples go to tell Jesus about them, Jesus launched into a sermon about his death. When he was approached, Jesus talked about what he was going to do for them. The hard work of seeing God, the hard work of knowing that God is with us, and the hard work of trusting that God will experience everything we do – including death itself – is what God finally does. Jesus, in a surprising way, doesn’t make his journey to the cross conditional on us changing who we are. Instead, Jesus goes to the cross so that we can, through him, discover who God is calling us to be. We’re invited to lose that life, I think, that doesn’t take seriously how we, through Christ, have already been changed. We are now part of a new story; we are part of Jesus’ story; and that’s story already a new and different ending. When we live into that change that Jesus has already offered to us, every aspect of our life becomes different. Our blueprint might be the same. We might feel like the person we’ve always been. And we will live through situations and experiences that will break our heart and God’s. Yet the new life God gives us is not about being more of who we think we should be. Instead, we can grow into the person God knows we can become. We are here, through Christ, to live into a brand new reality that sees ourselves, our neighbors, and our world differently. We are here to change where we look; to look beyond ourselves and instead to keep our focus on the Jesus who is lifted up; and who – through love – draws you, and me, and everyone else into a new world, a new reality, and a new humanity that will, in the end, change.